Well, well, well. It's been a while since we've had a good catch up, hasn't it? Posts around these parts for the past six months plus have been sporadic, rushed and lacking in enthusiasm, I feel. And personally I don't think that's how blogging should be at all - it should be fun, a hobby (for most!) that allows you to fill your little corner of the world wide web with your musings and share the things you're passionate about in a creative and personal way. That's how it should be. I just began this paragraph with 'Lately,' - then subsequently hit the backspace key slowly seven times after realising that my 'blogging rut' has been happening for quite some time now, and it isn't really a 'lately' sort of thing. It's not that I've lost my love for writing or my interest in social media, it's more that life has simply been practicing its little habit of 'getting in the way'. YouTube. Oh, YouTube! I'm loving you right now. I'm having a little moment with you. If you hadn't already gotten the memo, I started a YouTube channel a few months ago - here - and as of right now, it's one of my most favourite things. Don't get me wrong, filming is a right struggle (understatement of the year) but it's an enjoyable struggle and the benefits absolutely outweigh the physical strain. It's incredibly rewarding and the most fun I've had in a long time. It takes up a lot of my time and energy, meaning that blogging has fallen by the wayside even more - "my bad, Blogger. Best, YouTube". When you're chronically ill it really takes that whole 'do less with more focus' thing to the extreme, as you physically don't have the strength to devote yourself to more than one or two 'projects' at the same time, let alone on top of maintaining your occupation if you have one, your relationships, your mental health and ensuring that you're getting enough rest. Being ill is a full-time job, and it means that you're often forced to prioritise when you sorely wish that you could do it all without a second thought. Thirdly, I guess I've just been feeling a little uninspired. I haven't had the spare energy to blog, nor have I wanted to put together a quick and unimaginative post just for the sake of publishing a new post. That being said however, blogging still remains to be one of my passions and after having already lost some extremely big things in my life due to ME, it'd be a real shame to see another thing that I love be stripped away. Kinda feels like I've got all the ideas but not the spoons. I'm still a little unsure on how to ease myself back into blogging on this site, but maybe committing to one post a week and seeing how that goes would be the best idea? No pressure, just a goal to aim for. Whatever happens, I hope you know how grateful I am for all of the support and love I've received since launching my blog just over a year ago. It makes my heart ache a little bit when I think of how my blog could be if I were healthy, but all of those feelings dissolve into nothingness when I focus on how much light blogging has brought into my life. Whether I start blogging on a weekly basis again or continuing focusing on YouTube or take a turn for the worst and end up doing neither, it's nice to know that I've made true friends through my little corner of the world wide web who will be there to cushion the falls and applaud the rises. 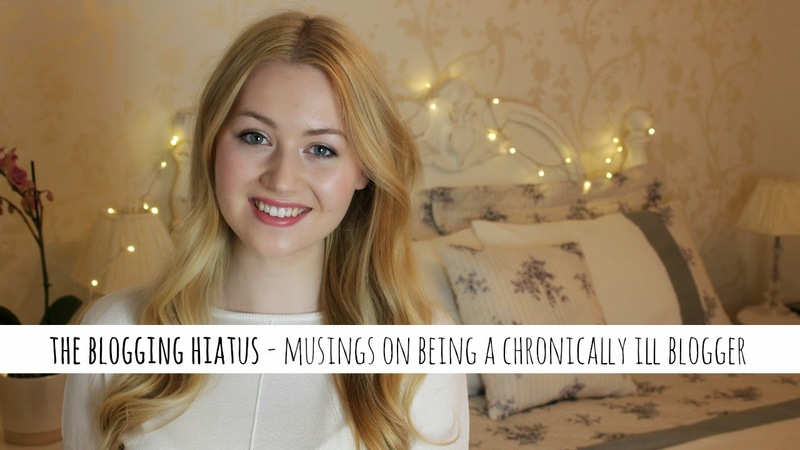 Are you also a chronically ill blogger - if so, how do you cope? Or if you're healthy but can't blog as much as you'd like to due to time restraints or other life-y things, do you have any tips on how to manage being a busy blogger that you'd like to share? I've learnt not to put pressure on myself to post something every week. Because I don't know how I'll be. So I write what I can. Which is normally a little, and then go back to it and it's finished when it's finished. But I've had months without a post before due to my health. It used to really bother me. But I feel quite proud of myself when I've finished one nowadays. Me too. I liked it when I posted the every week and got in a routine. That's a goal for the future. hello, I have cronical illness, that is reflux or duodenum inflammation that also lead to heart tachycardia, fast pulse and sometimes irregularity, and I feel my heart most of the time how it beats which annoys me, plus that stomach issues that i have, so I understand you, i was so ill 2 years ago that couldnt go out of the house was so dizzy, then I get better but not fully recover, i still feel dizzy a little and my stomach is not fullly heaty, it is often catch air into itself causing feeling of dizzines and like i am baloon, - and i get tired more easily, I also do youtube and blog a little to distract myself from my health issies. I like youtube very much as you, its my hobby, but i not born in uk or usa so my english is not perfect and sometimes i get a feeling that ppl give me thumbs down for it, and lately was sad about it that my videos get more thumbs down then thumbs up and had sad momment as thought that nobody likes me and what is wrong with me. You've got such a good readership Meg that we'll always be here however often you blog - your channel is doing so well also, contrast girl - 6K you are on it like a car bonnet! Take your time to chill out, max, relax all cool, and make sure you post when you feel well enough :) Sending you hugs! Meg, your posts always left me with so many emotions. You are wonderful. And again. And again. Trust me, what you call two or three things which you can't hold to because of illness...not every healthy person will do it as great as you. I still don't know how you manage it and even if it's impossible for me to really understand wht you are going through, I feel it and it make me so proud for you. Who knows, what your life be, have you enough energy - maybe it won't be about blogging at all, or it will mix with other things and you lost passion for it, or something else...so maybe it won't be better. Argh, I feel it's a mess - just wanted to say that what you are doing now is alredy so great, whenever you post once a week or once a month, because behind your posts I always see you. A person. A person with healthy soul and mind. Writing - it's just a way, a way of sharing your conten, so you don't betray it with YouTube, videos is just another way. You content is bigger than that you could squeeze in only writing or talking, so maybe sometimes it's just that one way is more inpiring for you than other. Anyway, send you all mu love and stongly hope you'll have spoonies for your passions and won't be too hard with yourself. "I've got all the ideas but not the spoons" sounds like me! That's exactly how I feel. You've made amazing progress with youtube recently, so I think just as long as you enjoy whatever you are doing it is fine! Your blog subscribers aren't going to go anywhere!